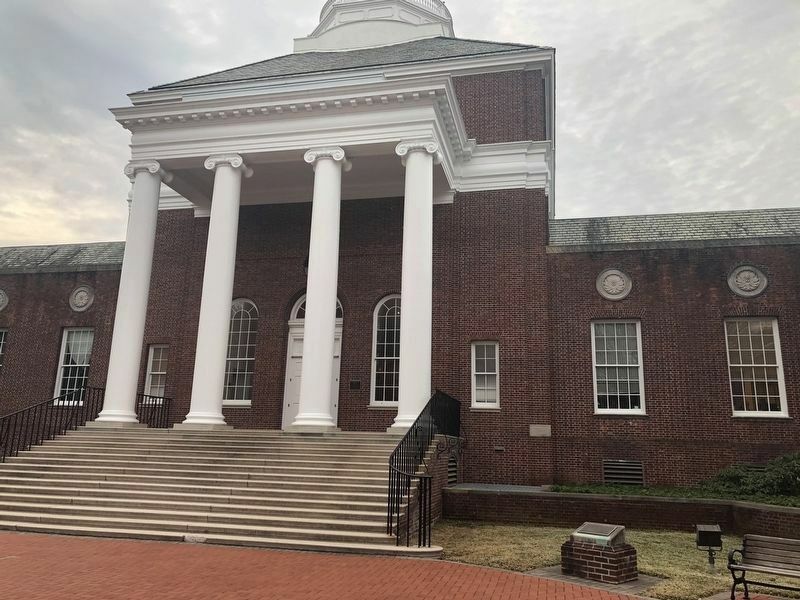 Located at the heart of The Green, Memorial Hall is a welcoming landmark and a signature building of the University of Delaware. 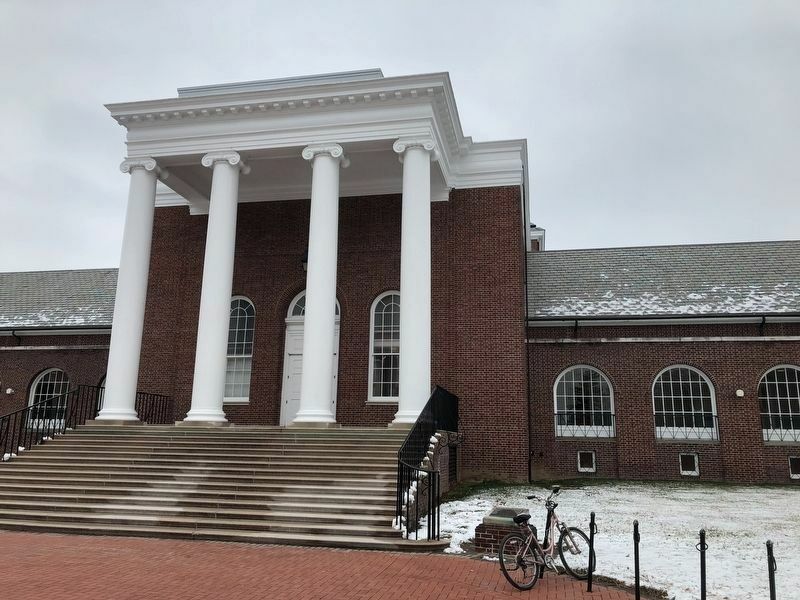 The University community marks the passage of time by carillon music from atop the building, including hourly chimes, UD's Alma Mater, Fight Song and seasonal tunes. 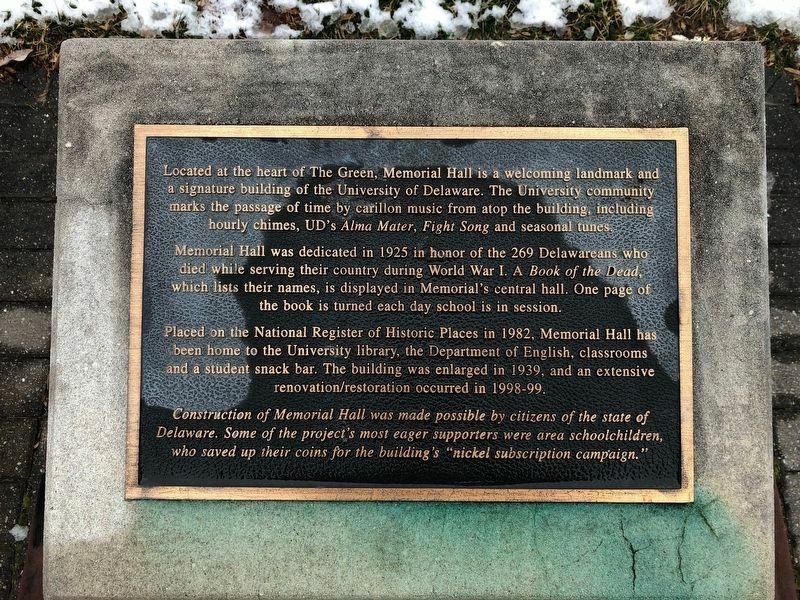 Memorial Hall was dedicated in 1925 in honor of the 269 Delawareans who died while serving their country during World War I. A Book of the Dead, which lists their names is displayed in Memorial's central hall. One page of the book is turned each day school is in session. 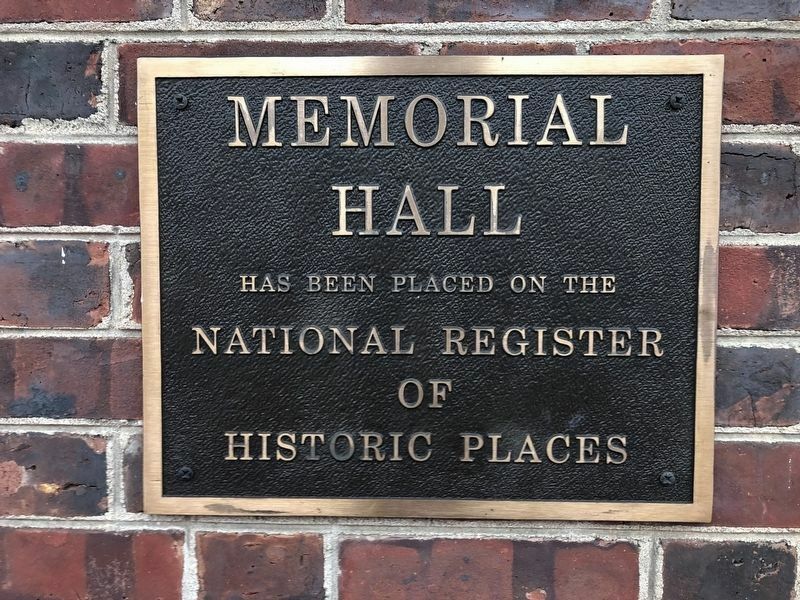 Placed on the National Register of Historic Places in 1982, Memorial Hall has been home to the University library, the Department of English, classrooms and a student snack bar. The building was enlarged in 1939, and an extensive renovation/restoration occurred in 1998-99. Construction of Memorial Hall was made possible by citizens of the state of Delaware. Some of the project's most eager supporters were area schoolchildren, who saved up their coins for the building's "nickel subscription campaign." Location. 39° 40.733′ N, 75° 45.119′ W. Marker is in Newark, Delaware, in New Castle County. Marker is on The Green. Touch for map. Marker is in this post office area: Newark DE 19716, United States of America. Touch for directions. Other nearby markers. At least 8 other markers are within walking distance of this marker. Lammot du Pont Laboratory (within shouting distance of this marker); In Memoriam (within shouting distance of this marker); Rev. Dr. Francis Alison (1705-1779) (within shouting distance of this marker); Hugh Martin Morris (1878-1966) (within shouting distance of this marker); Harry Fletcher Brown (1867-1944) (within shouting distance of this marker); Dr. Walter J. Hullihen (1875-1944) (about 300 feet away, measured in a direct line); Mentors' Circle (about 400 feet away); University of Delaware (about 400 feet away). Touch for a list and map of all markers in Newark. More. Search the internet for Memorial Hall. Credits. This page was last revised on March 15, 2019. This page originally submitted on March 2, 2019, by Devry Becker Jones of Washington, District of Columbia. This page has been viewed 89 times since then. Photos: 1, 2. submitted on March 2, 2019, by Devry Becker Jones of Washington, District of Columbia. 3, 4. submitted on March 15, 2019, by Devry Becker Jones of Washington, District of Columbia. • Bill Pfingsten was the editor who published this page.